222 Rajprarop Road Rajthavee, Pratunam, Bangkok, Thailand. Standing 88 stories high, Baiyoke Sky Hotel is the tallest hotel in Thailand and promotes its height with an observation deck where guests can take in the sights of Bangkok. It features 4-star rooms with views of the city. Baiyoke Sky treats guests to deluxe amenities, including a limousine service and Health and Fitness Club. Staff are available 24/7 and can help with booking tours and tickets. It also has a gym with a swimming pool. The air-conditioned rooms overlook the skyline and are fitted with modern luxuries like mini bars and slippers. Each have a refrigerator, a flat-screen TV and a private bathroom with bathrobes. Baiyoke Sky Bangkok provides a variety of in-house dining options with Bangkok Sky and Roof Top Bar and Music. Room service is provided any time of the day, and a large variety of restaurants and cafés can also be found nearby. Baiyoke Sky Bangkok Hotel is surrounded by the area's sightseeing attractions, including Centralworld and Big C which are a short walk away. 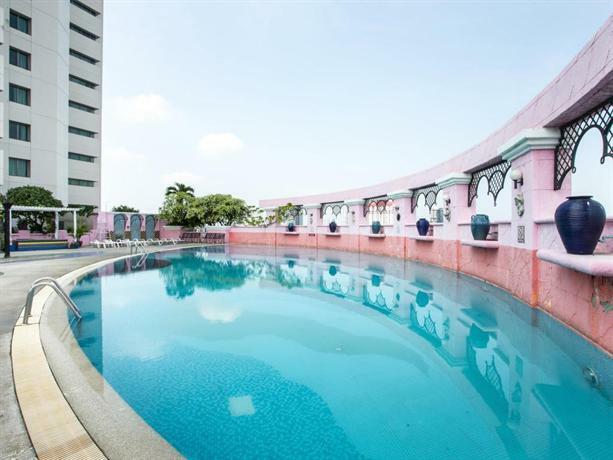 It is 10 minutes' walk from Pratunam Market and is situated next to Baiyoke Sky Tower. Copyright © 2009 - 2019 by www.hotelmapcenter.com. All rights reserved.